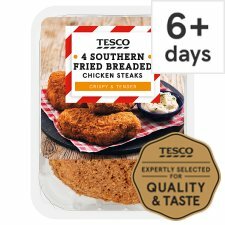 For stress free teatimes rustle up southern fried chicken steaks made with 100% chicken breast. Generously coated in seasoned breadcrumbs for a crispy bite. Oven cook in 25 minutes. These tasty steaks make a quick and easy family favourite. 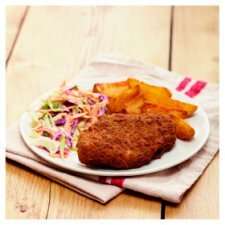 Serve your chicken steaks southern style with crunchy coleslaw, stuffed potato skins and corn on the cob. Click the Recipes tab at the top of this page to find inspiration for delicious homemade sides. Expertly selected for freshness and quality. 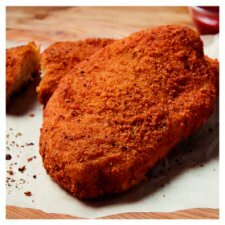 INGREDIENTS: Chicken Breast (59%), Water, Wheat Flour (Wheat Flour, Calcium Carbonate, Iron, Niacin, Thiamin), Rapeseed Oil, Semolina (Wheat), Wheat Protein, Wheat Starch, Salt, Spices, Maize Flour, Rice Flour, Onion Powder, Dextrose, Yeast Extract, Garlic Powder, Yeast, Sunflower Oil, Spice Extracts, Onion Extract, Garlic Extract. Instructions: From chilled: Place on a baking tray in the centre of a pre-heated oven.